Do ER Nurses have PTSD? When you work in an ER for any length of time, you realize that there are a substantial group of people who you see on a regular basis. A few hundred actually. These we refer to as the dreaded "frequent flier". Yes, they sometimes come in weekly, even daily, sometime even 2 or 3 times in a day. There are some who come in only on weekends. They are the drunks, the migraineurs, the chronic painers, the depressed, the obsessive constipationists, etc etc etc. Some of them, when you see their name on the triage screen, you want to run for the hills. Others, you think whatever... They are not the kind of people who get the concept of primary care. 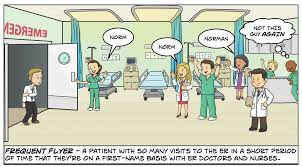 We are part of their life, the ER for them, is like you and I going to the grocery store. It's just routine. We will keep seeing them, that won't change. The only thing that will stop them from coming is if they move away or die. 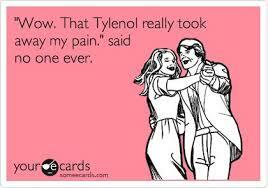 Step away from the tylenol! There have been a lot of advances, shall we say, in my ER since the dark ages when I started. We have a lab in the ER now. The techs draw the blood an do some of the blood tests. That's cool.